Strathmore Secondary College and Moonee Valley City Council are committed to creating a safe and more sustainable environment for students. Walking and cycling to school is a great way for your child to start the day, as it stimulates the mind and improves overall health. This map has been created through the Better Moves Around School Program, this program brings Council and schools together to improve safety and encouraging walking, cycling and the use of public transport. 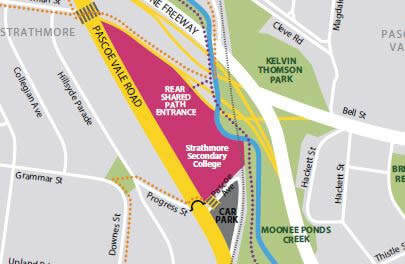 Moonee Valley Council has identified Drop and Go locations for Strathmore Secondary College students, each location is within a comfortable walking distance. The map has been designed to encourage more students to walk to and from school at least part of the way to reduce congestion in Pascoe Vale Road. Strathmore Secondary College is very appreciative of the support of Moonee Valley Council and encourage the College community to support this initiative.